Performance management refers to those activities that are executed to ensure that all the goals of an organization are consistently met in an efficient and effective way. It also focuses on managing the performance of a department, employee, organization and processes used in building products and services. The performance management process is usually applied to employees. Managing the performance of an organization covers a variety of functions including the continuous monitoring of their performance, setting of expectations, planning and delegating work, rating employee performance, developing capacity to improve employee performance and rewarding the great performances of hardworking employees. Effectively managing the performance of all aspects of an organization especially its employees and systems is extremely beneficial when it comes to efficiently delivering operational and strategic goals. You can also expect proper performance management to work in directing or increasing financial gain by growing sales and reducing operational costs, motivating work force by optimizing incentive plans, improving employee engagement and creating professional development programs and improving management control by being more responsive and flexible to the needs of management, displaying data relationships and simplifying communications linked to strategic goals scenario planning. Another advantage of proper performance management is its effectiveness in continuously improving the performance of the staff and the entire organization. The process makes sure that the performance of each employee greatly contributes in achieving the goals of an organization. If you want to become an expert in performance management, then be aware that Brainmeasures can offer you a performance management certification course which is comprehensive enough to provide all the information that you need to become successful in this field. The performance management course offered by this well-trusted and reputable online certification company is guaranteed to help you hone your skills in managing the performances of all aspects linked to your organization especially the people. The training that you can get from this performance manager course will work in improving your skills in handling the tasks and responsibilities linked to effectively managing performance. The certification course will also provide information about the major objectives linked to human performance management, how you can successfully carry out your tasks in this field and your major roles. 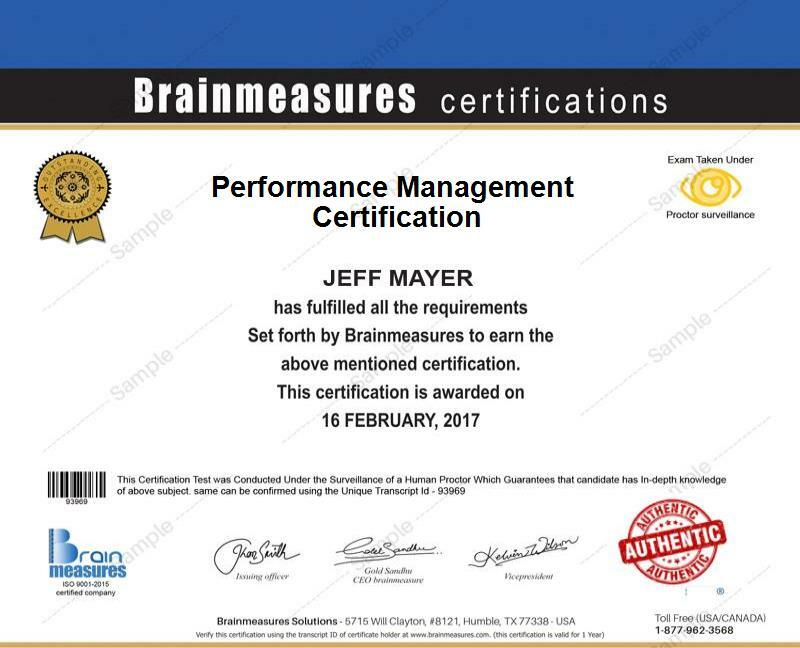 Before you receive your certificate in this field, you will be required to take and pass the performance manager exam developed by the professionals and experts in Brainmeasures. The performance management certification program can work perfectly for individuals and professionals holding vital positions in an organization. The certification course fits more perfectly for HR systems officers, human resource managers, general managers and any other professional who is responsible in effectively managing performance appraisals and career development in an organization. Aside from the huge increase in the number of career opportunities for you, being a holder of a performance management certification can also help you in increasing your income. You can expect to earn around $47,000 to $173,000 per year as a performance management expert. You can even expect this amount to go higher if you already hold the top performance management positions in an organization.